If you wondered what a B-cell looked like, here one is… 1926. And if you wondered what B-cells went into… 45 volt vacuum tube radios. Candies you know in a form you don’t see today. 1961. Actually, I stand corrected: The ever-awesome Elizabeth Plaid asked if they still make Butterfinger BB’s. Nope, those were discontinued in 2006, but Wikipedia says they became Butterfinger Mini-Bites in 2009. 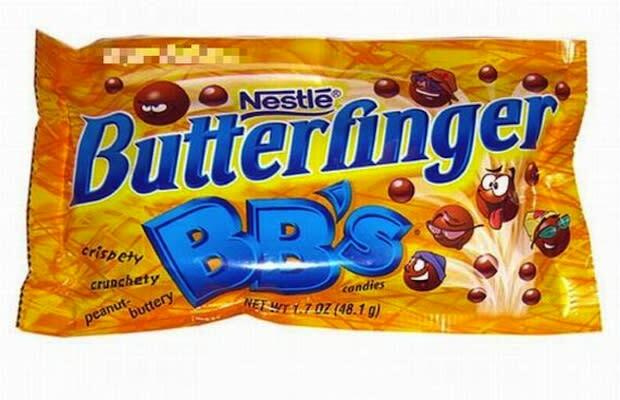 Which do not resemble 2000s BB’s as much as they do 1960s Butterfinger Chips, so you do get to see these today. Thanks, Beth! Best Foods/Hellman’s mayonnaise, 1937, with the ‘splainin’ male chef. Attention studyboppers: You need a good portable typewriter! Guys: Do you need a Cracker Jack box degree to impress your friends, family, boss, or community? Send in this coupon! □ Check this box if you want a college deferment from going to Vietnam. For some reason this reminds me of the ‘entry test’ for art schools; draw this character, send it to us, and we’ll send you course material. In this case: here is a box of parts, so assemble this television, and if the sucker works you’re in our school. And you will notice the test television is hyped, too. That’s the kind of worker so many businesses want – ones with empty round smiling heads and muscles. And who will repair the electrical appliances? Nowadays no one because they’re regarded as disposable; buy new ones! 1954 advertisement for a correspondance course electronics school.